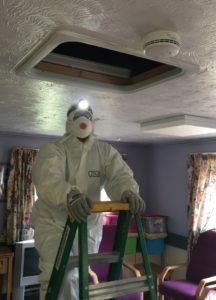 Warden call systems connected to Aico mains powered Multi-Sensor, Heat and Carbon Monoxide (CO) Alarms, are maximising safety for sheltered housing residents in South Cambridgeshire. As the South Cambridgeshire Council was already planning to replace the existing hard wired Warden Call systems in its sheltered housing, it decided to also upgrade the Smoke and CO Alarms. And Aico was able to offer a bespoke solution to wirelessly connect its alarms to the new Warden Call systems using its Ei414 Fire/CO Alarm Interface. The Ei414 Interface can also be used to interconnect Aico Alarms to Sprinkler and Part 1 Fire detection systems. The new Smoke Alarm systems are being installed to Category LD2, with a Heat Alarm in the kitchen, a Multi-Sensor in all circulation spaces and entrance halls and CO Alarms in properties that are not fully electric. Properties and tenants that need extended protection from risk will see their alarm systems extended to include additional rooms for added safety. Eddie was impressed with Aico’s award winning AudioLINK data extraction technology, which is built into the Multi-Sensor and CO Alarms. AudioLINK enables real time data to be extracted from each alarm using its sounder directly to a smartphone or tablet via a free App to create an Alarm Status Report. The Report displays useful information about the alarm, such as alarm sensors status, number of times tested and removed and any alarm activations.